A quick and easy meal for lunch rather than dinner as didn’t fill me up. tasted quite fresh for a frozen meal and plenty of taste. Lean Cuisine satay beef with rice is a great lunch option for me,quick and easy and it tastes very nice.The satay flavour is lovely and l like the rice with the beef. I regularly eat these meals & find them quite tasty, it helped me lose weight because they are portion controlled. I would prefer if they did not have red Capsaicin in it & this meal will not be suitable for men due to the small size & it would leave them still hungry. I really do like this meal from Lean Cuisine for the flavours. The satay beef with rice is tasty with a hit of veggies. The steam range is a cut above other ranges. 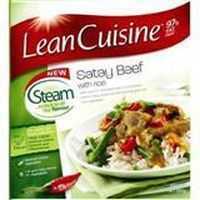 How would you rate Lean Cuisine Steam Satay Beef With Rice?